So what exactly is a warp optimization rift? It's like a cloud thingy that's all warped and optimized. It's a fight between the Warps and the Optimizations. It's a bug in the Linux kernel. 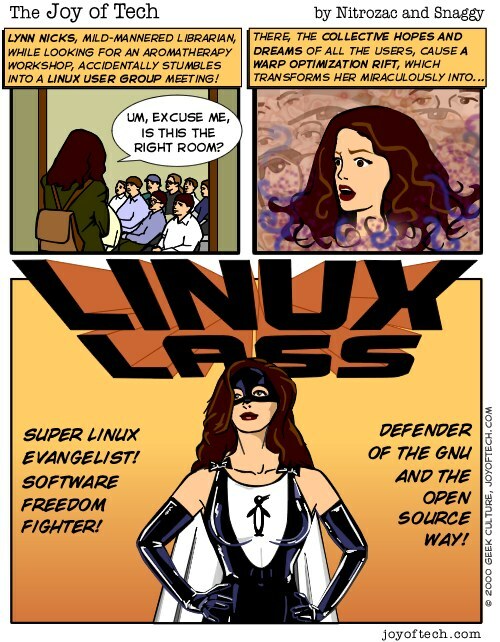 It's the non-proprietary way Open Source geeks create their superheroes. It's the thing I've been stuck in lately. We double dare you... tip the cartoonists! Joy of Tech is brought to you in part by Ellen Spertus! Thanks Ellen! Each month Snaggy and I have comics in MacAddict Magazine. They feature a new never-before seen Joy of Tech in print, and we put a little bundle of goodies on the CD ROM! The Joy of Tech is now a featured link over on Macinstein's Mac Search Engine! Thanks Rich!